The King Alfred Playes are a long established local drama group; with a recent decline in membership, they have decided to wind up the group. They are very kindly distributing their assets amongst 17 local groups and we were thrilled to receive a substantial donation which will help to pay for the theatre hire for both this show and The Producers. 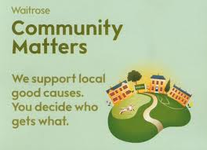 We were thrilled to be selected to be one of the three good causes of the month at Waitrose Wantage. They very kindly donated £256 to AmEgos. Mel took our fabulous 'cover' shot for posters and tickets, the cast headshots and the rehearsal photos for Deathtrap. Mel is a fantastic friend to AmEgos. King Alfred's Head in Wantage have been great friends to us - rehearsals and pub quizzes - Michael and his team have always made us welcome. Pop in for a pint when you are passing! 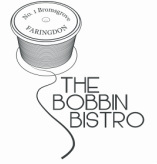 Melanie from the Bobbin Bistro in Faringdon very kindly took an advert in the Deathtrap programme.